For American women of my generation, Anita Hill testifying at Clarence Thomas’ 1991 Supreme Court nomination hearings about the sexual harassment she experienced at his hands was one of the first major public events we experienced that taught us that sexism was real. It taught us that a man can be accused of victimizing a woman, and he can be rewarded for it by becoming a justice on the Supreme Court. 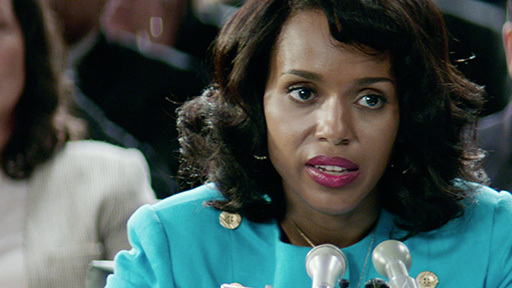 This Saturday, HBO releases Confirmation, a film that depicts those hearings starring Kerry Washington as Anita Hill. In addition to starring in the film, Washington also acted as an Executive Producer, meaning that she was heavily involved in shaping the piece and taking part in the interviews with the real-life people on which this is based, especially Hill. Despite being pulled in the directions of race and gender (and possibly a third direction as a liberal), Washington insists that the goal of the film was to make all the players involved three-dimensional people, not stock characters standing in for ideas in a film expressing her political agenda. Washington’s greatest hope is that people will watch Confirmation and remember that our government only works as well as our participation in it. That a large part of the corruption in our government is allowed to exist and fester because of our apathy. Some of her favorite moments in the film involve the times when the any of the players — Hill, Thomas, or Joe Biden — are talking, and phones ring in congressional offices. For the rest of this interview, check it out over at The Hollywood Reporter. Confirmation premieres on HBO this Saturday!